I have been wanting to create an online space for a site like Simple Organized Lifestyle for years. Years. But I let fear of failure turn into something worse… regret! I regret that I didn’t start this site a long time ago when I first thought it was something I’d love to do. Maybe there’s something you’ve been wanting to do that is totally out of your comfort zone. It could be starting a new business, learning a new skill, traveling to a new place, or meeting new people. 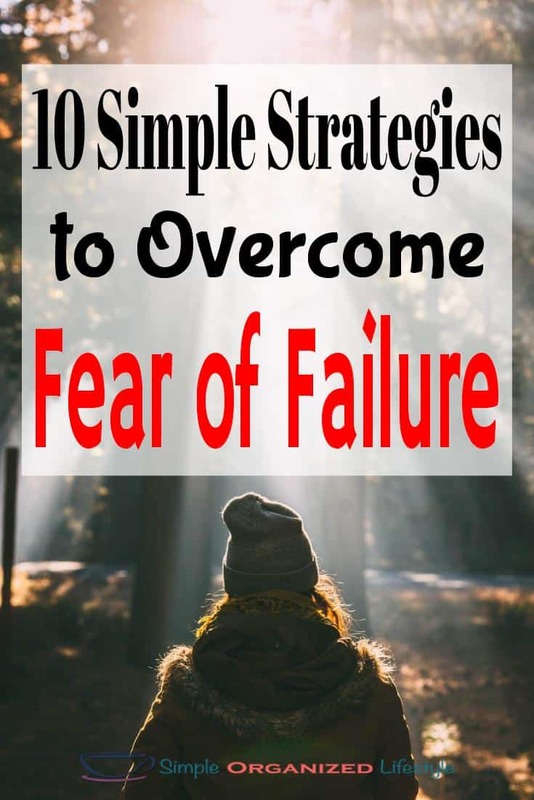 Does fear of failure hold you back? Let’s talk about how to overcome it and move forward with new goals and dreams. A few years ago, I felt like a failure with finances. We had good incomes but no money left to show for it. Fast forward to today and our finances look completely different. We let that failure (bad financial decisions) turned into motivation (financial freedom) and it has totally changed our finances for the better. Let failure turn into motivation. We live in a world of instant gratification. That makes it really hard when we don’t see quick results from a new project. Instead, setting realistic expectations makes it easier to keep going when things don’t always go as planned. If you’re working on losing weight, setting expectations too low may not be motivating and setting expectations too high may be disappointing. Set realistic expectations with your new project to see success and gain momentum. Just because you fail at something doesn’t mean you’re doing something wrong. Instead, it could mean you’re doing something bold and new. Learning new things takes time and comes with new risks. If you seek perfection, you will almost always be disappointed. One of my favorite movies is Hope Floats. The main character in the movie gets so wrapped up in the idea of perfection that she loses herself in the process. She essentially has to start over and realizes that perfection is not even obtainable. This struggle is so real today, especially when social media makes it look like others have achieved perfection. Focus on progress, not perfection, to move past the fear of failure. If you don’t start or don’t try, you automatically lose. If you do try, there will be wins and losses. By not trying, you’ll miss those amazing wins! Not taking a chance on yourself creates a limiting belief. Limiting beliefs hold you back from doing things you have always wanted to do. Ask yourself what you have to lose vs. what you have to gain and take a chance on YOU! Failure is a great teacher! When Plan A does not turn out how we want it to, we use what happened to learn, grow, and move on to Plan B. You can almost always find something positive out of the experience and use that to keep moving forward. You control your thoughts about failure. Whatever that “thing” is, whether it’s interviewing for a new job, learning a new skill, losing weight or giving a speech, you are in control of your thoughts. Your chances and confidence improve greatly when you think and see yourself successful! In other words, just take that fear and meet it head on… embrace it. Recognize the feelings when they come along and take control. All of us get comfortable in our routines and it’s easy to become creatures of habit. Stepping out of your comfort zone brings new opportunities. You never know what might be waiting ahead so give yourself permission to to look! Famous athletes, entertainers, and successful entrepreneurs often make it look like some people are highly successful while others are not. What we don’t often see is the failures along the path to their success… how many strike outs, how many failed album deals, and how many “no’s” it took until there was finally a “yes.” Failure is often the path to success! Let those past failures stay where they belong in the rearview mirror. Look forward. Don’t dwell on past failures or you’ll miss future successes that are waiting just ahead! Let’s avoid the path of regret and, instead, be open to new possibilities! What strategies have you used to overcome fear of failure? Be encouraged to face those fears and move forward with your goals and dreams. Take a chance on You! I’ve had a really hard time overcoming my own fears recently. I have become my own worst enemy but this post is very encouraging. I can turn my fear of failure into success! I have had to truly embrace #3 in order to start blogging. It’s hard when you can’t do things exactly as you envisioned. But like you mention its far worse to live with regret! Great post! Yes, I felt the same way but progress will keep us moving forward! Thanks for commenting!